Browse: Home / The astonishing radioprotective effects of MISO explained: Nagasaki, Hiroshima and Chernobyl survivors speak out… eat to live! One of the most amazing chapters in the true history of healing foods comes from the final chapter of World War II, in the aftermath of the United States’ dropping of two atomic bombs on civilian populations in Japan. Millions of innocent civilians were exposed to extreme levels of ionizing radiation, and rates of cancer immediately skyrocketed thereafter. 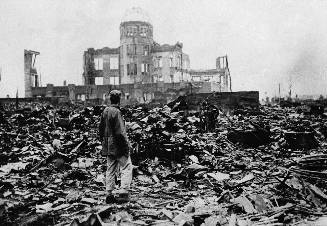 Yet some people seemed to be immune to the effects of harmful radiation… even people who were less than a mile from the epicenter of the atomic bombs. What was different about these people? As you’ll learn here, they were all consuming miso, a staple of the Japanese diet made from fermented soybeans, rice and salt. When the 2nd atomic bomb was dropped in Nagasaki on August 9th, 1945, physician Tatuichiro Akizuki, along with 20 employees, was taking care of 70 tuberculosis patients at “Uragami Daiichi Hospital” (St. Francis Hospital) about 1.4 km away from the hypocenter. However, these people including Dr. Akizuki did not have any acute radiation disease. Dr. Akizuki considered that this was the result of consuming cups of wakame miso soup (miso soup with garnish of wakame seaweed) every day. Later, this was translated into English and became known in the West. In the Chernobyl of nuclear power plant accident on April 26, 1986, in the Ukraine, many Europeans consumed miso soup as a preventive measure for radiation diseases. Therefore, Dr. Akizuki can be considered to be the first person in Japan to point out radioprotective effects of miso for maintaining health. The answer was clear: “The mechanism of the radioprotective effect of miso is considered to be closely related to substances produced during fermentation stage,” Watanabe explains. Although the medical doctors gave up on her, Sawako survived: “My mother didn’t show me a mirror until I was cured. However, I was able to see my hands and leg, which were very dirty and had a bad, rotten smell. On the rotten spots there were always flies. When the skin healed, I broke it because it was itchy; finally it became a keloidal condition. I didn’t see my face until it was finally cured. However, sores remained on my nose and pus remained on my chest. My hands and chest had masses of skin which remained until I was twenty.” Because of her disfiguration, Sawako was ridiculed, nicknamed “Hormone Short,” and told she could never marry or have children. After completing school, she became a high school physics teacher and met a young chemistry teacher who ate very simply. The couple married and attended lectures by George Ohsawa, the founder of modem macrobiotics in Japan, and he said that only people practicing macrobiotics would survive future nuclear war. Sawako went on to have seven healthy children and raised all of them on brown rice, miso soup, vegetables, seaweed, and other healthy food. Source: Sawako Hiraga, “How I Survived the Atomic Bomb,” Macrobiotic. November/ December 1979. They also conclude that soy might be useful to use alongside radiotherapy to both increase the toxicity of radiation to CANCER cells and decrease the toxicity of radiation to HEALTHY cells. The cancer industry, of course, has zero interest in any of this, since toxicity and cell damage is central to the industry’s repeat business model of recurring cancer. But for those individuals who wish to practice dietary habits that may help prevent or reduce the damaging effects of ionizing radiation, fermented soy in the form of miso may be an intelligent and practical choice. It’s clear that additional scientific research is desperately needed in this area. What if cancer radiotherapy could be made less toxic and more effective at the same time? Shouldn’t modern medical science investigate this further? “A delay in mortality was obvious in all three miso groups,” says the study. But it also warns that once the radiation exposure is too great, even miso cannot stop the mortality rate. Extremely high radiation doses, in other words, were able to override miso’s protective effects and cause mortality in a few days, regardless of how much miso was consumed. What dose caused this? 15 Gy (gray). The “gray” unit describes the amount of ionizing radiation absorbed by tissue. 15 Gy is equal to about 15,000,000 microsieverts or 1.5 million millirems. If you absorb 1.5 million millirems all in a short time span, you’re dead no matter what. Personally, I don’t eat soy. No soy burgers, no soy protein, no soybean oil and not even steamed edemame. But I do eat small quantities of miso from time to time because fermented soy is unique. It’s not the same food as unfermented soy. If you eat miso, make sure it’s made from organic, non-GMO soybeans. Soy is one of the most commonly genetically modified crops, so you have to choose organic to avoid the GMOs. You also have to be careful not to over-consume miso. The fermentation process can create glutamic acid as one of its products, and for those who are highly sensitive, even a little glutamic acid can cause a headache. Tomatoes and seaweed also contain glutamic acid, so if you’re able to eat those without any problem, then you’re probably not sensitive to it. Miso comes in different grades based on fermentation duration. The longer the fermentation time, the higher the grade and the more expensive the product. There’s obviously a point of diminishing returns on this, too: beyond 180 days of fermentation, there’s unlikely to be any additional measurable benefit to the miso. Even fermentation of just 3-4 days produces significant beneficial properties. Understanding the need for radioprotective foods, we’ve sourced a very limited supply of what may be the most pristine source of freeze-dried organic miso in the United States. We offer this as a nourishing food, without any claims of curative effects or radioprotection (see below). This is medium-grade miso (it’s yellow in color) that balances fermentation time with affordability. It’s entirely made in the USA, using these U.S.-derived, certified organic ingredients: organic soybeans, organic rice, salt, organic Aspergillus oryzae (fermenting agent). We’ve laboratory-verified this miso powder to meet our A+++ high standard published at LowHeavyMetalsVerified.org. The product is certified kosher and it’s vegan, too. Because it’s freeze-dried, this powder retains nearly all the color, taste, texture and nutrients found in the original fermented miso. As a powder, it has an extended shelf life and very high portability. Nevertheless, if you wish to enjoy a delicious source of organic miso, which is part of the health-promoting macrobiotic diet, we offer this honest, lab-verified yellow miso in a convenient freeze-dried format. At the very least, you’ll enjoy a nutritious source of health-supporting nutrients found in organic miso. Quantities are extremely limited, and we were only able to source a few hundred kilos of this material, so it won’t last long in our store. As usual, it’s extremely difficult to find clean, quality sources of anything these days. That’s why we always run out of the “good stuff” so quickly. We simply refuse to lower our standards and sell the garbage bulk products you’ll find on Amazon.com and elsewhere.